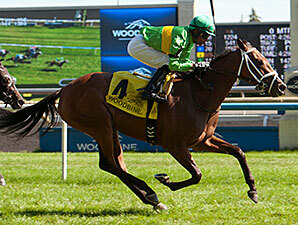 Fifth with a quarter mile to run, Woodford Racing's Season Ticket was in charge with a furlong to go and coasted to a comfortable win in the $250,000 Wonder Where Stakes, the third jewel in Canadian Triple Tiara, Aug. 9 at Woodbine. The Lemon Drop Kid filly cruised past runner-up Ice Festival en route to a 1 1/2-length triumph, taking the race for Canadian-bred fillies as the 6-5 favorite. Pacesetter Pengally Bay was just a head back in third. With Patrick Husbands riding for trainer Mark Casse, Season Ticket covered 1 1/4 miles under a hand ride in 2:03.01 on firm turf. She has a 3-2-1 record from nine career starts. Husbands saved ground from fifth on the rail in the early running, while Pengally Bay set fractions of :25.77, :50.44, and 1:14.95 through six furlongs under mild pressure from Ice Festival. Brooklynsway stalked the pacesetters from fourth position down the backstretch and moved closer to contention through the final turn. Season Ticket stayed on the rail through the turn, before angling outside of Brooklynsway for the stretch run, gathering momentum, and then bursting clear of the field. "She's a classy little filly and I was very high on her going into to this race. Her last breeze was unbelievable," said Husbands. "The rails are pretty far out, and there were some decent fillies in there I needed to keep my eyes on. I had a perfect trip." Bred in Ontario by Sean Fitzhenry, Season Ticket proved her turf talents as a 2-year-old last December at Gulfstream Park, graduating in a mile maiden allowance at first asking. She was third behind Academic in the Woodbine Oaks, the first jewel in the classic series for Canadian-bred fillies, and in her most recent start, was second in the Ontario Damsel Stakes July 18. Under equal weights of 121 pounds, Season Ticket returned $5.80, $3.40, and $2.60. Season Ticket was $120,000 purchase at the 2013 Keeneland September yearling sale, where she was offered by Keith Lancaster's agency. Her dam is the Montjeu mare Game.